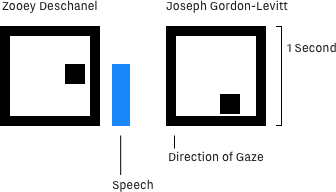 I visualized gaze using a schematic that allows the interactions between characters to be read outside the timing of the scene. Consider the Bench Scene from 500 Days of Summer, below, and the visualization drawn from it. This is an undeniably useful notation, in that it in making the interactions legible over time. However, it also substitutes and replaces the real interactions with representations. Interpretations impossible while looking at the videos themselves become possible. To explore this dynamic, I produced an interactive model that replaces faces with data portraits of the directionality of their gaze. To underscore the dehumanizing aspect of visualizing, instead of extracting the direction of gaze, it generates its own gazes, inventing new narratives and augmenting reality with them.